Salem was founded in 1626: its tricentenary was very much a big deal, celebrated with myriad events over several weeks and its quatercentenary is already on the horizon. I don’t know anything about its centennial, but its bicentennial was marked with at least one event (and probably more): an elaborate banquet at Hamilton Hall presented by the in-house caterer, John Remond. No doubt his wife Nancy, a “fancy cake maker” contributed much to the event, as well as his children. Catering and provisioning constituted the family business for this prominent free black family, along with hair dressing and unflagging advocacy for abolition. 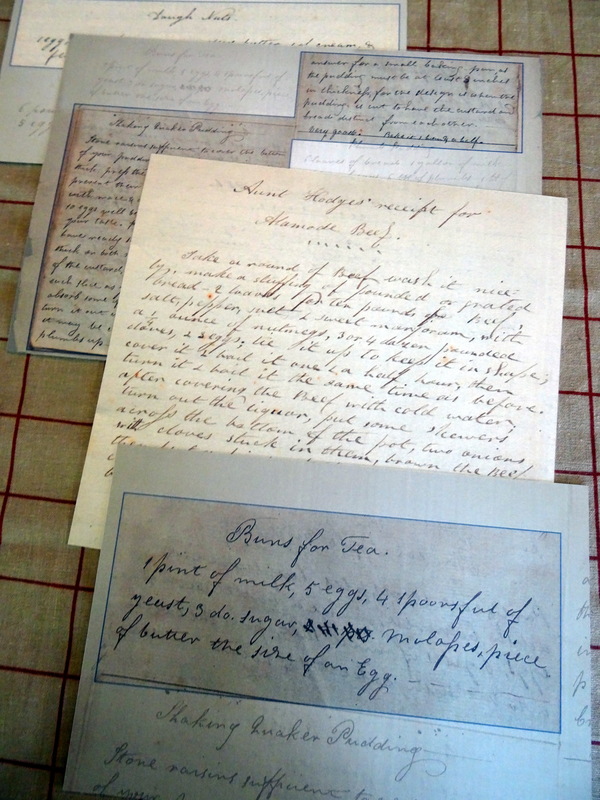 Despite the fact that 1826 would have been the bicentennial year, the feast actually happened on September 18, 1828: a bill of lading in the Remond Papers at the Phillips Library of the Peabody Essex Museum indicates that Mr. Remond had received a delivery of “one large green turtle” just a week before, a valuable commodity that must have ended up in his first courses of green turtle soup and green turtle pie. The dish that really stands out for me on this elaborate menu is pigeons transmogrified: not being a culinary historian it seems rather exotic to me, and I wondered if this could be Remond’s original creation. 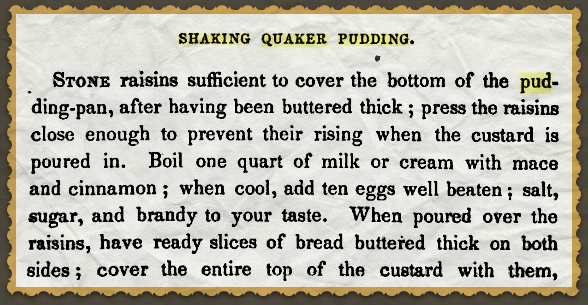 No way: it’s in nearly all of the eighteenth- and early nineteenth-century cookbooks, apparently a classic. Hannah Glasse’s Art of Cookery made Plain and Easy (first published in 1747 and never out of print over the next century), the Joy of Cooking of its era, contains a recipe for Pigeons Transmogrified, as does Elizabeth Raffald’s Experienced English Housekeeper (1769) and all of their imitators. There were basically two recipes for this dish, as you can see below: one which encased the pigeons in puff pastry and another encasing them in cucumbers. I think the former represents the straightforward English cooking presented by Mrs. Glasse and the latter is more French-inspired, and I’m not sure which version was prepared by Mr. Remond in 1828. In any case, his guests, all 170 of them, had plenty of other choices if their preferences did not include pigeons. John Remond’s menu for the bicentennial dinner at Hamilton Hall, Remond Papers, Phillips Library, Peabody Essex Museum (accessed via American Broadsides and Ephemera); title pages of Hannah Glasse’s Art of Cookery made Plain and Easy and variant recipes for Pigeons Transmogrified. I spent a lot of time last weekend de-stressing in front of and around the television watching Turner Classic Movies, to which my little set is almost permanently tuned. There were old Christmas movies on, and it seemed like every time I looked up from whatever I was doing various characters were getting tipsy on a seasonal drink called a “Tom and Jerry”. It appeared to be an eggnog-like concoction but I had never heard of it: what was it and where did it go? I did a little Google research, and turned up multiple recipes, images of vintage Tom and Jerry punch bowls and cups (which got me even more curious and excited), and some nice sentimental articles about this “all-American” drink’s survival in the upper Midwest. Tom and Jerry is a lighter eggnog variant, which utilizes many eggs but milk (or even water, see below) instead of cream, sugar and spices and rum and brandy, and is typically served warm. Based on the sheer survival of all the punch sets on the second-hand market alone, it must have been very popular in the middle decades of the twentieth century. Just one of many Tom & Jerry bowls on Etsy, Vintage mid-century Fire King. This old drink has nothing to do with the cat and mouse cartoon: according to my (exclusively internet, I must admit) sources, its origins can be traced to either an extraordinary 1821 book by a British journalist, Pierce Egan, titled Life in London, or, The day and night scenes of Jerry Hawthorn, esq., and his elegant friend, Corinthian Tom, accompanied by Bob Logic, the Oxonian, in their rambles and sprees through the metropolis or to a legendary nineteenth-century American bartender named Jerry Thomas whose pioneering 1862 mixologist tome How to Mix Drinks, or the Bon-Vivant’s Companion featured a recipe for the Tom and Jerry. No one seems to have connected all the dots between the popular British Tom and Jerry characters and the American drink, but the recipe seems very British to me, reminiscent of all the frothy “lambswool”- like drinks of centuries past. And no matter, I’m always more interested in the search for the source rather than the actual commodity/consumable, and the research into the drink’s origins led me to Egan’s text, featuring his Tom and Jerry characters exploring the highs and lows of London society with delightful illustrations by the Cruikshank brothers. Alcohol was definitely a major part of their exploits. Illustrations/scenes from Pierce Egan’s Life in London, British Library. To make the batter: 5 lbs sugar/ 12 eggs/ a half glass Jamaica rum/ 1 ½ tsp. ground cinnamon/ ½ tsp. ground cloves/ ½ tsp. allspice. Beat the whites of the eggs to a stiff froth, and the yolks until they are as thin as water, then mix together and add the spices and rum, thicken with sugar until the mixture attains the consistence of a light batter. To deal out Tom and Jerry to customers: Take a small bar glass, and to one tablespoon of the batter, add one wine-glass of brandy, and fill the glass with boiling water, then grate a little nutmeg on top. and bake for half an hour! The digitized version of Mrs. Chadwick’s cookbook cut off the recipe as well, but fortunately I found another source. All this work for a raisin custard bread pudding (the Shaker Quaker puddings seem to omit the bread) which I doubt I will ever make (unless I add lots of rum or bourbon). 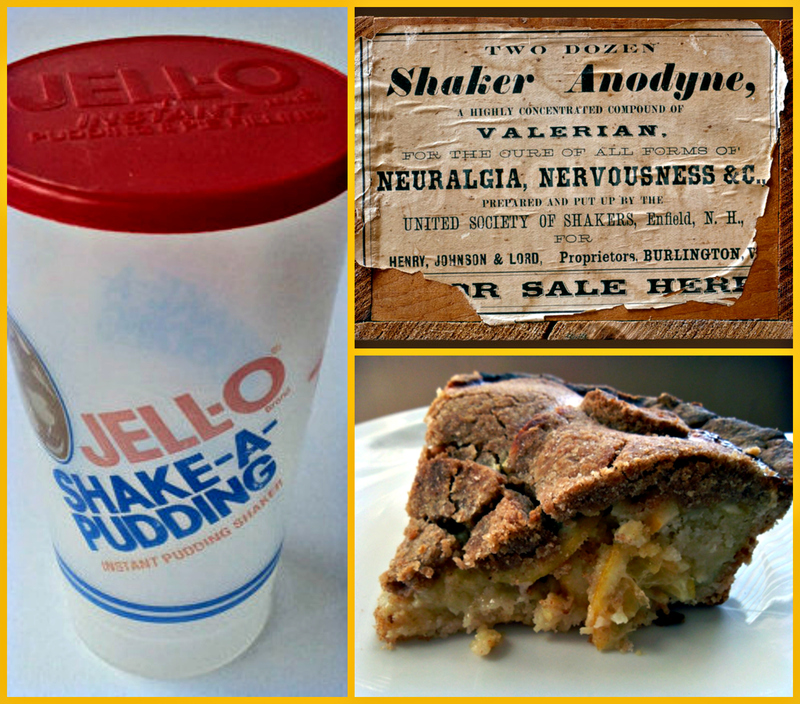 However, I did discover several recipes that did tempt me, especially “Shaker Lemon Pie”, apparently a favorite of Martha Stewart’s. And the pudding shaker. The delicious-looking Shaker Lemon Pie–made with thin lemon slices–is from the blog Love & Flour.